“Each new creation presents a visual manifestation of the sum total of this lifelong investigation and serves as a reaffirmation of my commitment to the arts,” said Mildred Thompson. 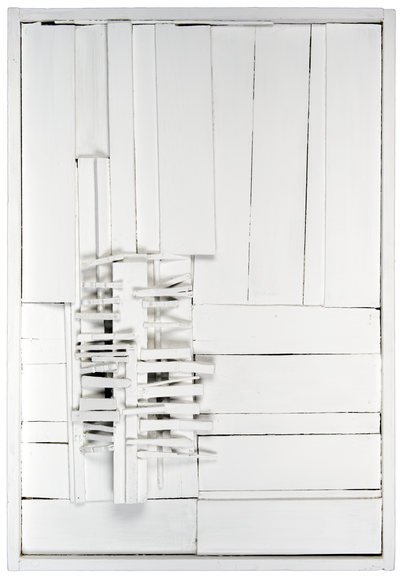 NMWA’s exhibition features four works by Thompson, including three wall sculptures made from found wood and painted white, and the expansive painting Magnetic Fields (1991), from which the exhibition takes its name. Magnetic Fields exemplifies Thompson’s style. She often found inspiration in scientific theories and universal systems. 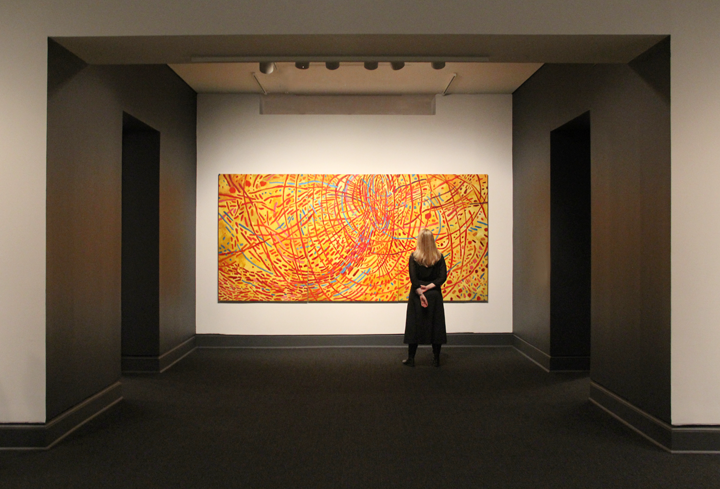 The triptych contains a vibrant, buzzing palette of yellows and reds—as well as a combination of calligraphic brushstrokes and geographic shapes—to evoke Thompson’s visual interpretation of the invisible forces of magnetic energy. After receiving her BA in 1957 from Howard University in Washington, D.C., Thompson spent three years at the Hamburg Art Academy in Germany. She later moved to New York City, where the Museum of Modern Art and the Brooklyn Museum acquired her work—a significant recognition of her talents. However, feeling the effects of racial and gender discrimination in the U.S., Thompson moved to Europe for 13 years. She returned to the U.S. in 1986, and proceeded to create art as well as teach art history, art theory, and studio art, in Atlanta for the last 18 years of her life. Over four decades, Thompson produced more than 5,000 works in painting, drawing, printmaking, photography, and sculpture. Thompson was one of only a few black women artists trained in the European tradition of Abstract Expressionism, to which she devoted her life. Renowned for her lively abstract paintings and unique use of color, Thompson continuously worked to expand her abstract language and encouraged her students to search for new modes of artistic expression. —Katie Benz is the fall 2017 digital engagement intern at the National Museum of Women in the Arts. Shinique Smith’s Bale Variant No. 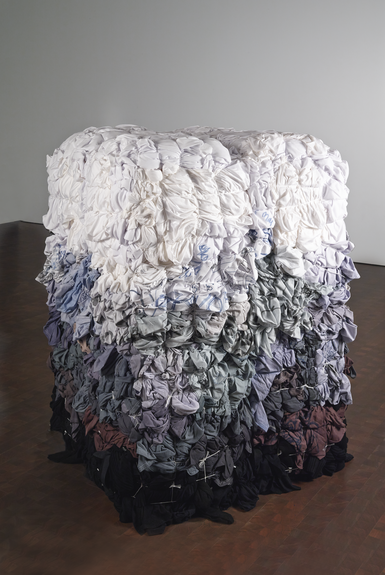 0017 is comprised entirely of found material; the massive installation involves more than 110 cubic feet of bundled fabric—mostly clothing—arranged in a white-to-blue gradient. Consequently, the density, scale, and weight of the piece all speak to Smith’s fascination with the ever-increasing velocity of American consumption. Bale Variant No. 0017, with its murky color scheme and battered textiles, conjures images of ocean debris and landfill compaction. Despite the almost overwhelming amount of content in the work, however, Smith’s roots in minimalism are evident in her dedication to clean, even shapes. Bale Variant No. 0017 equalizes the personal narrative in each piece of found material. In treating both well-loved and long-forgotten articles of clothing with the same detachment, Smith assigns these fabrics a new sense of connection that questions the foundation of their original value. 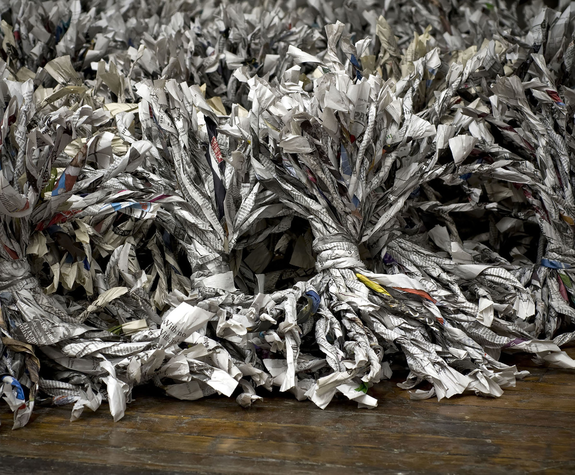 Additionally, there are personal notations from Smith and her friends hidden inside the folds of the clothing, further emphasizing the many contradicting perspectives contained within the bale—and, by association, within the act of consuming and discarding. Like Bale Variant No. 0017, another work by Smith in Magnetic Fields, Whirlwind Dancer (2013–17), is both massive and densely layered. However, Whirlwind Dancer contains a distinct sense of motion that Bale Variant No. 0017 lacks. As the title suggests, Whirlwind Dancer’s climbing lines, twisting colors, and nebulous form create a cyclone of ink, acrylic, paper, fabric, and wood. 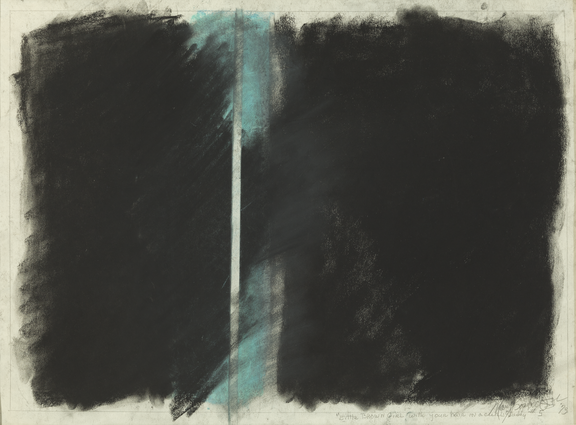 Illumination #1 is the first in a series of 49 works, all created between 1984 and 1986. The series was inspired by Carter’s first trip to Rio de Janeiro, Brazil, where she became fascinated with the blend of European Catholic and African Yoruba faiths. Carter’s sharp, rhythmic mark-making references the music of Rio, the pulse of the city that Carter became enamored with. Shapes fit together with distinct sense of motion in Illumination #1, recalling celebration and festivity. From 1997 onward, Carter has worked exclusively on frosted Mylar, a type of plastic sheet developed by DuPont during the 1950s. By using Mylar, Carter achieves a unique “luminosity, density, and transparency” in her artwork—particularly true in Cantilevered #14 (2014), Carter’s second work on view in Magnetic Fields. Part of a series of 37, “cantilever” is an architectural term referring to a rigid support beam anchored only on one end. In Cantilevered #14, nebulous blocks of color and texture are invisibly suspended in a pool of transparent Mylar. The almost precarious stack of shapes calls to mind the delicate balance of family, friends, work, health, news, and social media in the 21st century, as well as the support nets necessary to maintain it. “I want my work to offer an experience to look and to see, to contemplate,” says sculptor and performance artist Maren Hassinger. With a career that has spanned over four decades, Hassinger continues to create works that invite viewers to contemplate issues of nature, culture, and identity. Hassinger’s abstract sculpture Wrenching News, on view in Magnetic Fields, explores such themes. 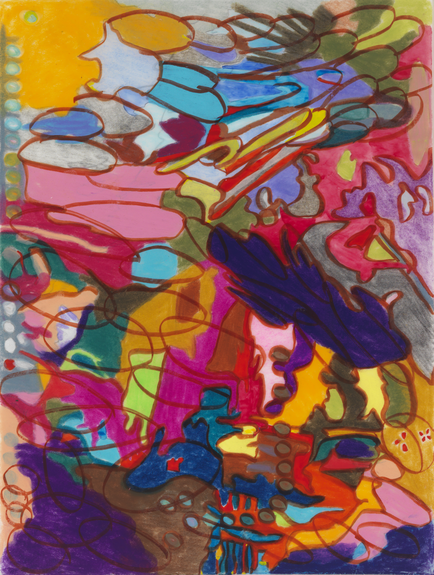 Hassinger began her artistic career at Bennington College in Vermont in 1965, where she planned to pursue a degree in dance but ultimately decided to focus on the visual arts. After receiving her degree in sculpture, Hassinger received her MFA at UCLA. The course of her career changed after she took a class in weaving, and she began to experiment with the malleability and texture of fiber when creating sculptures. Hassinger’s fascination with the transformative qualities of unconventional materials continued to grow. 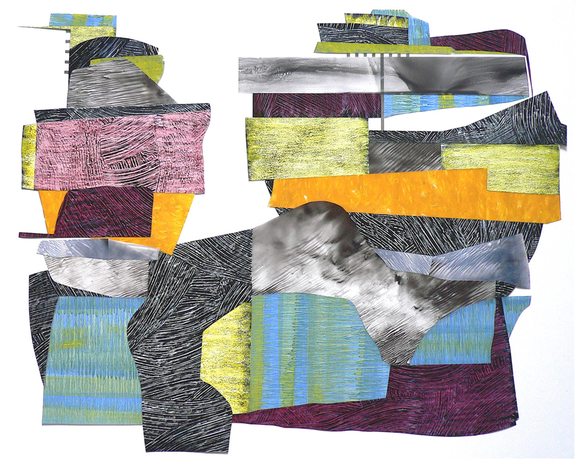 The twisting of the material comes from the artist’s background in weaving and working with textiles. The busy, complex appearance of her work calls to mind the sociopolitical challenges that can arise from the devastation caused by a natural disaster. At the same time, the work sparks conversation about how tragedy and suffering are part of the human experience. Racism is Like Rain, Either it’s Raining or it’s Gathering Somewhere (1993) combines several trademark aspects of Mary Lovelace O’Neal’s style: bold, precise color; contrasting, velvety black; and aerobic, free-spirited movement. Together, they work to illustrate marginalized experience through representative abstraction. A vibrant “cloud” of heavy brushstrokes permeates the stark, matte background, underscoring the omnipresent and unavoidable nature of racism. The piece was originally on view at the California Afro-American No Justice, No Peace? Resolutions exhibition in 1993, a reaction to the Rodney King verdict and ensuing race riots of 1992. O’Neal’s roots in activism—she was mentored by figures like Martin Luther King, Jr., Malcolm X, and James Baldwin during the 1960s—are inextricably intertwined with her artwork. She examines the continuing influences of racism and celebrates the resilience of black culture in her other Magnetic Fields works “Little Brown Girl with your Hair in a Curl”/Daddy #5 (1973) and “…And a Twinkle in Your Eye”/Daddy #6 (1973), both of which involve O’Neal’s signature black pigment smothering a streak of light blue. O’Neal does not use abstraction as an elaborate metaphor for black experience; rather, she views abstraction as a more transparent way to “give voice to the ‘intangible elements of the human spirit.’” O’Neal’s repeated use of black pigment and its obvious symbolism throughout her works speaks to this unfiltered exploration of racial politics in the United States. Consequently, O’Neal’s paintings carry a sense of optimism and joy despite the weight of their subject matter. Although Racism is Like Rain, Either it’s Raining or it’s Gathering Somewhere portrays a push-and-pull of power dynamics, there is a whimsical freedom in the illusion of movement. NMWA hosts the exhibition Magnetic Fields: Expanding American Abstraction, 1960s to Today, opening to the public on Friday, October 13, 2017. Organized by the Kemper Museum of Contemporary Art in Kansas City, Missouri, Magnetic Fields is the first U.S. exhibition to place abstract works by multiple generations of black women artists in context with one another. Taking its title from a vibrant painting by Mildred Thompson, Magnetic Fields features work by 21 visionary women artists born between the years 1891 and 1981. The exhibition presents abstract art in a variety of artistic mediums, including printmaking, painting, sculpture, and drawing. These works—often incorporating unconventional materials or monumental scale—reveal the artists as under-recognized leaders in abstraction. Thompson describes her work in the visual arts as “A continuous search for understanding. It is an expression of purpose and reflects a personal interpretation of the universe.” Similarly, artworks on view in Magnetic Fields celebrate each artist’s view of the universe through choices related to form, color, composition, and material exploration. Magnetic Fields re-contextualizes these works within the history of American abstraction. Thompson’s works are featured alongside art by Candida Alvarez, Betty Blayton, Chakaia Booker, Lilian Thomas Burwell, Nanette Carter, Barbara Chase-Riboud, Deborah Dancy, Abigail DeVille, Maren Hassinger, Jennie C. Jones, Evangeline “EJ” Montgomery, Mary Lovelace O’Neal, Howardena Pindell, Mavis Pusey, Shinique Smith, Gilda Snowden, Sylvia Snowden, Kianja Strobert, Alma Woodsey Thomas, and Brenna Youngblood. Together with the display of dynamic works by an inter-generational group of artists, an exhibition catalogue helps spark conversation about these artists and their place in history. Magnetic Fields represents a long-awaited milestone in honoring and recognizing the practitioners of abstraction. Reserve your spot today for a first look at the exhibition during the opening party on October 12, from 7:30–9:30 p.m. Magnetic Fields is on view October 13, 2017–January 21, 2018.